This month marks 8 years of blogging! Happy blogiversary to me! How? I'm not really sure. But according to my archives, I've been doing this blogging thing for a while. It's on the internet so it must be true. After eight years of blogging, I've amassed a pretty decent wardrobe. Of course, I had hits but I also had misses -- as in there are certainly some pieces that have been on the Muse that I simply no longer wear. But one thing that I've tried to accomplish over the years is the ability to build a wardrobe with neutrals and basics. Yes, I will always incorporate unique and creative pieces, but the basics are still the basics. Neutrals: colors that blend and match with other color combinations. Examples include shades of brown (camel), gray, navy, olive and black and white (cream). Basics: essential clothing items that can coordinate with anything. Examples include nondescript T-shirts and sweaters, denim jeans, black pants, shoes in neutral tones. Like I said, I won't stop wearing unique items when cute pieces catch my eye! But I'm looking to add more neutrals and basics to my closet. What's your favorite neutral or basic piece to wear? Happy MLK Day! Happy Blog Anniversary. This is such a cute look and I love these flats. Love this look! 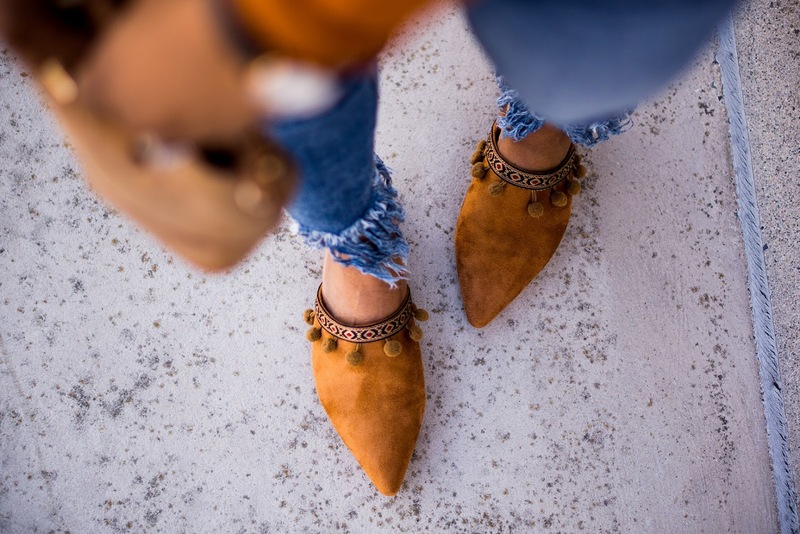 Those flats are super cute! Happy Blogiversary Cheryl!! I am all about the basics! 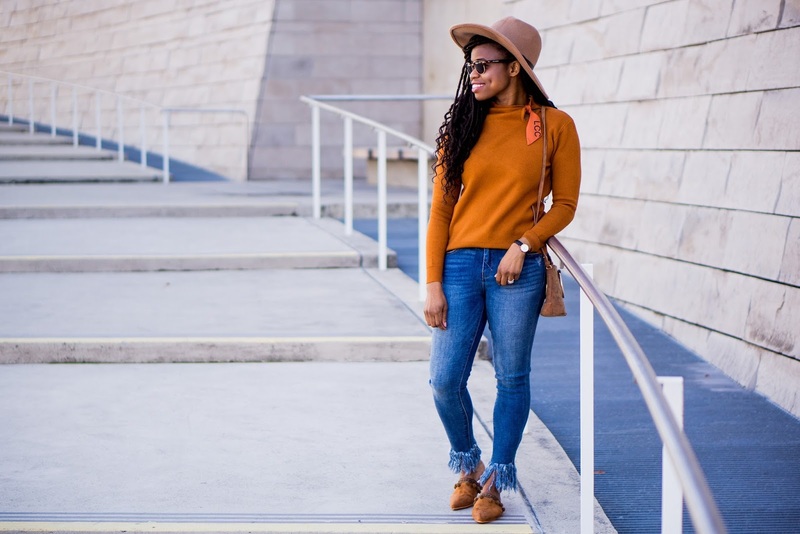 My favorites are my camel sweater, black denim, and camel or grey coat! Happy Blogaversary! Eight years is fabulous, and it's so fun that you can look back and see the evolution of your personal style. Of course having a closet full of versible neutrals is always ideal. 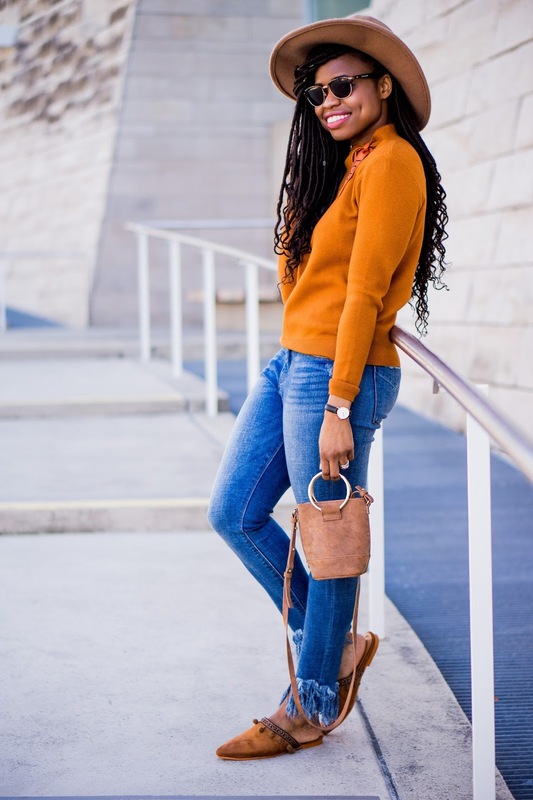 Love your rust colored sweater! Such a cute look! Loving that hat - it's perfection. You look beautiful and I love these shoes so much!! Oh my goodness 8 years!! Congrats to you! and your outfit is perfection! Such a cute lady. Love the laid back vibe. You look stunning as always. Also, didn't you start blogging in 2009? Either ways Happy Blog Anniversary. I did start in 2009 but I wasn't consistent until 2010. But technically, I guess it's been 9 years. Let's see how I feel about it next year if I say that's my 10 year blogiversary or not. Oh my heavens I'm all about this look! From the color of the top to the style of those shoes to that adorable bag - so much cute! Happy eight years of blogging to you! I love this casual look, but that bag is too cute! I forget we have the same year and anniversary of blogging. Mine was in Dec. though. Happy blog birthday! The rust colour top looks so good, I just love splashes of colour, albeit in neutral styling. Have a great new week, lovely! Happy Blogiversary to you! Cheers to many more! 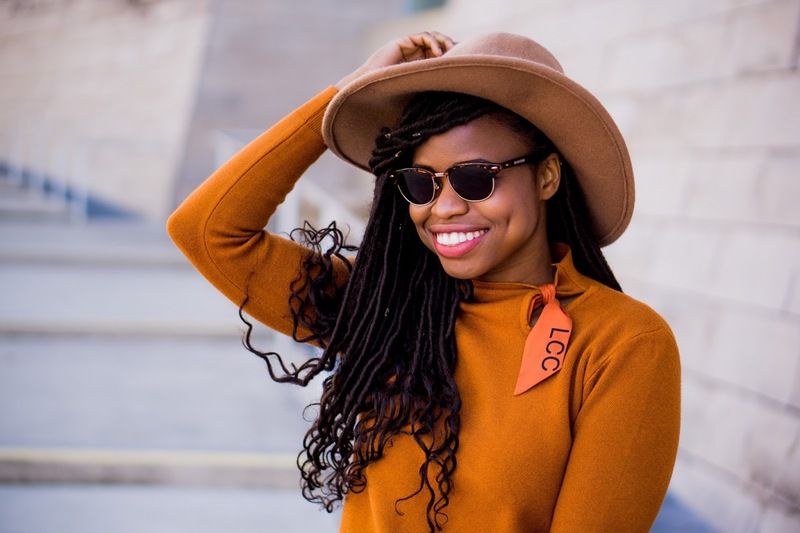 You must have amassed so many cool fashion items since you started blogging. So cute! Love that bag and those shoes! Happy Blogaversary! 8 years?! That's huge congrats! Love this color scheme! Such good tips and LOVE the picks you made! I really like the way you combined colors! Looks fantastic! Blogger vets, yessss! Happy blog birthday, lady! 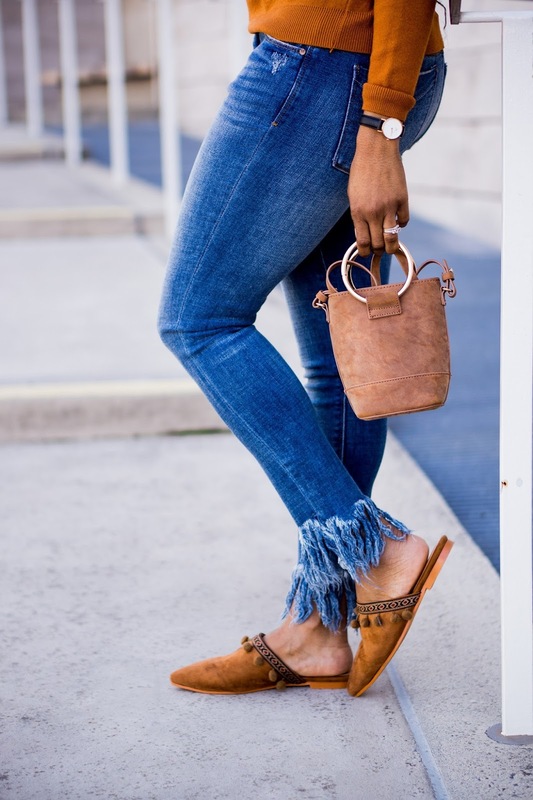 Loving this cool look- and those frayed jeans! Happy Blogiversary! That top is Fantastic on You. My basic piece is a good pair of jeans. Girl that color on you is so fabulous! Congrats on your anniversary! What a cute look dear! I love the matching sweater and flats! 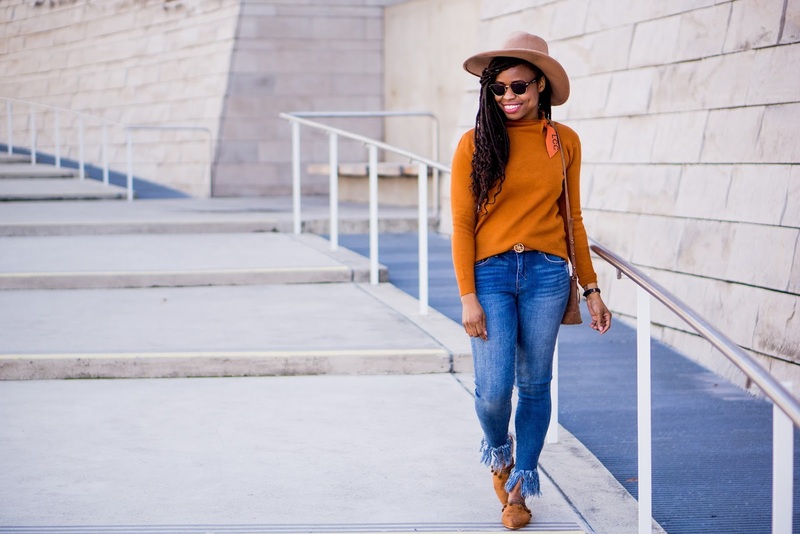 I truly believe neutral basics should always be in our wardrobe.